Her reminder bracelets are designed to easily be moved from wrist to wrist through out the day as a reminder of which side to nurse on next. And the nursing necklaces give baby's curious fingers a place to land and hold their attention (ask any nursing Mommy... a distracted baby while nursing can make things a little complicated!). Some people's happy place is the beach or a quiet spot in their garden. I'd like to propose that if you quilt, sew, craft, love fanciful prints, or even just appreciate the feel of crisp cotton that you stop by Fiberologie in St. Pete... it could be your new Happy Place! I happened on Fiberologie completely by accident while doing a google search for designer fabric. The Fiberologie website is super cute, but I wasn't prepared for the wonder of this shop. I stepped onto the quaint little front porch one morning and Karrie, the owner of Fiberologie, was having a cup of coffee. 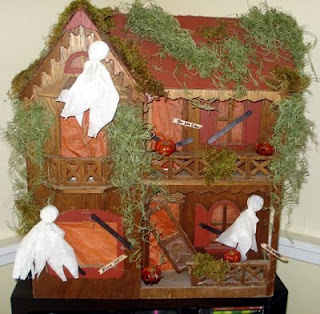 She opened the door to the 1920s house and amidst the beautiful white wood work, built in shelves, and brick fireplace was bolt after bolt of amazing fabric. Textiles from lots of top designers like Amy Butler and Heather Bailey, as well as really unique finds like some imported Japanese prints. Not only will you find the newest designer fabrics in the industry, Karrie also supports local crafters by featuring some handmade pieces in her store as well as some of her own handiwork. If you're not already a fabric addict, Karrie will help you along with the many classes she hosts. In addition to classes, you can stop by for a quick make-n-take project, or donate your time to a charitable cause by participating in one of Fiberologie's charity days. I recently spent a morning at Fiberologie making "pink" beanies for the Susan G Komen foundation. I couldn't think of a better way to spend a leisurely morning than sewing away, in great company, for a good cause. 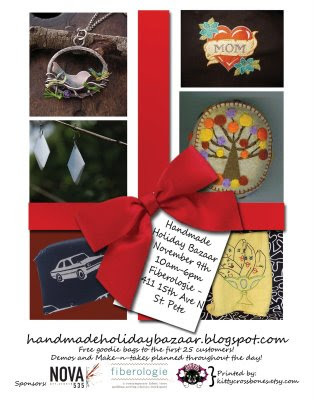 I'm beyond excited that Fiberologie is our host for Handmade Holiday Bazaar! 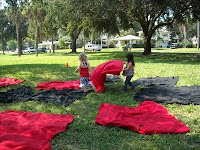 Come to the bazaar to shop the vendors and discover Fiberologie... it's yet another reason to love St. Pete! We are a crafty/artistic bunch here in the Whittington household. My Doug never took his artistic ability too seriously because he didn't like being confined to the limitations set by an art class... so his biggest claim to fame is several promotional t-shirts he drew for his Fraternity in college (which he didn't have the foresight to save... silly boy!). He doesn't stretch his artistic muscle that often but got inspired by a pumpkin carving contest we had with my Dad and brothers while on vacation last week. 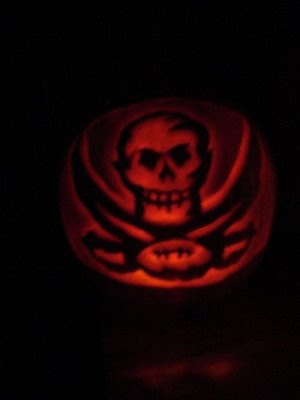 He was in pretty creative company, but he blew the competition away with this Bucaneer's logo pumpkin. The banner and avatar in my Etsy shop are my Halloweeny one, so I thought this was as good a time as any to take a little poll to get a consensus on which of the Elle Belle "looks" I've had in the past is a favorite. So here are your choices, please take a second to vote for the one you like best by using the anonymous (if that matters to ya ;)) poll thingie in the right margin. Thanks! 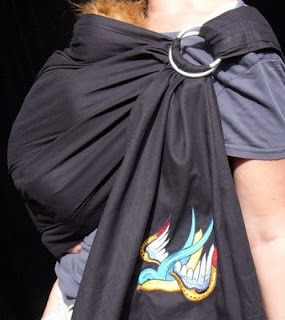 This sling earned Elle Belle a spot in the finals of the Etsy Handmade Kid Contest! That's a huge deal, I mean there are thousands of us on Etsy so kudos to Stacey! 1, 2, 3, 4 who loves to count even more? I do. 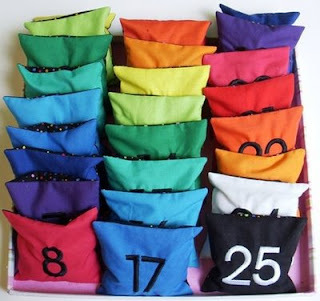 However, I can count up to ten these days so I don't need these bags but what a fun gift for that kid in your life who is learning to count and learn their colors; or maybe you can buy a set of these for that dippy friend who is always shortchanging you when it comes to splitting the bill. Or maybe you can pass these bags off as change while shopping since these beanbags are probably way more valuable than our U.S. dollar-roonie. My little piece of Etsy has been up and running every day for the past 22 months. Our official vacation doesn't start until this weekend, but I wouldn't have been able to fill any orders received between today and Mon. the 27th, so I put my shop on vacation. I'm having sort of a strange reaction to my shop being empty... it's spooky! I hadn't thought about it like this before, but the shop is a compilation of all our little bits of handiwork, it's full of my favorite fabrics, items that were and some still are really useful to me as a new Mom, and they're all gone. Okay I understand they'll all be back with just a click of a button, but still... it's creepy... I don't like it! I'm so excited about having the Flying Zoo at the Handmade Holiday Bazaar! I'm particularly fond of wood toys. There's something about the simple aesthetic appeal that owning a hand crafted wood toy can bring. All those flashing buzzing singing plastic toys just entertain/distract children... wood toys are engaging, they're really playing, using their imagination. Monika started making these wonderful mobiles more than 15 years ago. Come out to the Handmade Holiday Bazaar to pick out a meaningful toy for the little ones on your Christmas list. After all, do you think they're really going to be passing that Sponge Bob video game down to their own children some day?! 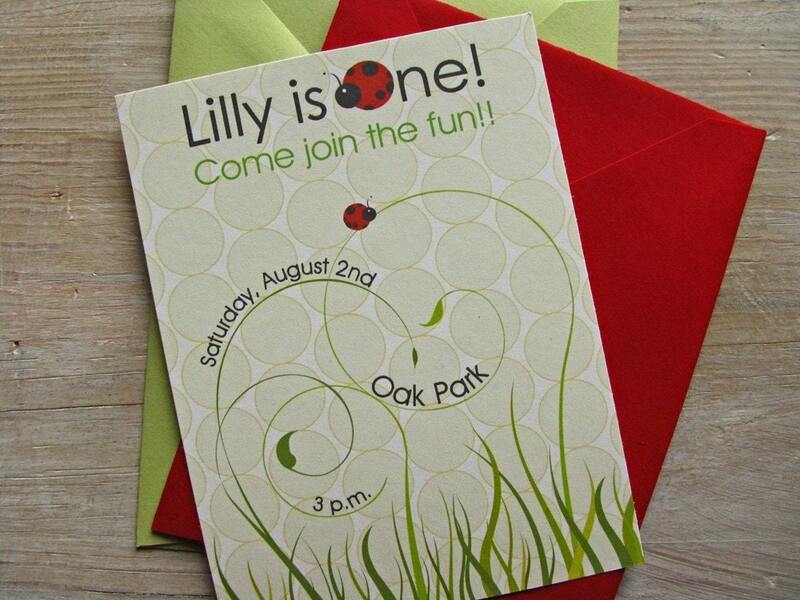 BNDesigns made some super cute invites! Elle's were a little different than these, they didn't have the circles on the background and were printed on crisp white linen paper with the moss green envelopes. She also made some matching thank you notes. 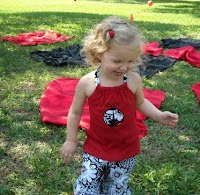 Lil Bug Clothing made this halter and short set. It's very well made, I am really happy with it. She even sent a scrap of the short material with it so that I could embroider/applique the ladybug on the top. Mom and Dad have to get in on the party fun too and it was the only excuse I needed to pick up one of The Funky Felter's rings... a ladybug of course! 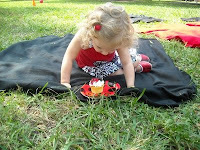 She was so sweet to include a little red felted ball clippie as a freebie with my order, which Elle wore in her hair. You can't really see it in this picture, but I made picnic blankets (a yard and a half each of polar fleece), sewed ribbon on the back to tie them with when they're rolled up, and embroidered a ladybug on each one. 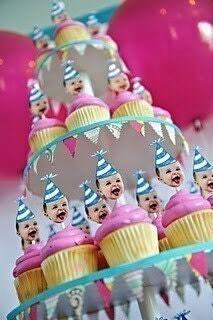 I sent those home with the parents after the party. Our favorite local bakery, Cakes by Carolynn made yummy cupcakes with piped ladybugs and you can also check out Elle's shoes in this picture that My Wee Feet custom made and liked so much that she carries them in her shop now. I met the girls of Cloud Nine Design at a craft show I went to long before I started planning Elle's party and knew then that I had to figure out a way to incorporate their super cute bubble wands into the next party I planned. 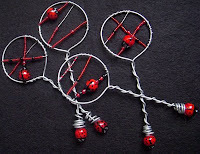 So I bought some handmade glass ladybug beads from Beauty with the Beads and Cloud Nine Designs incorporated them into these adorable bubble wands that we gave as favors. I don't remember which online party supply site I bought the favor boxes from. 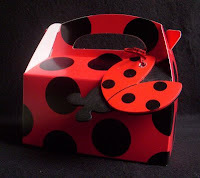 I found some wooden ladybugs at JoAnns, wrote the kids names on the back with a white paint pen, Doug drilled holes in them for me so I could tie them to the boxes. I got some clear screw top jars from a seller on Ebay and my Dad designed the labels for them. 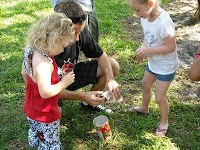 We have a great recipe for bubbles so I made a big batch divvied it up and waalaa! Check out the awesome flyers Kitty Crossbones made for the Handmade Holiday Bazaar! As a vendor run show, we're doing some really vendor centric things, including showcasing some of the fab wares you'll find at the show in the advertising. 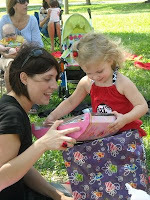 Being Elle’s Mommy has been a wonderful experience for so many reasons! Just one reason is that she inspired my passion for sewing. I’ve been sewing lots of projects for Elle’s 3rd birthday party and finished her birthday banner yesterday while she was taking her nap. I had it hanging in the living room when she woke up. She was all groggy from her nap still, her hair in a big messy pile on top of her head, blanket in tow. When she saw the banner she dropped her blanket, ran over to it, and said “Is this for my birthday?” I said “yes, it says happy birthday. We’ll hang it up at your birthday party.” She started jumping up and down singing the H-A-P-P-Y song, then mid-note ran over to give me a big hug and kiss and said “Thank you Mommy! Thank you for making me something special!” Someday she’ll understand what a wonderful gift she gave me!